Volterra, sited on the confluence of the Cecina and Era Valle, is a very ancient city of Etruscan origin. 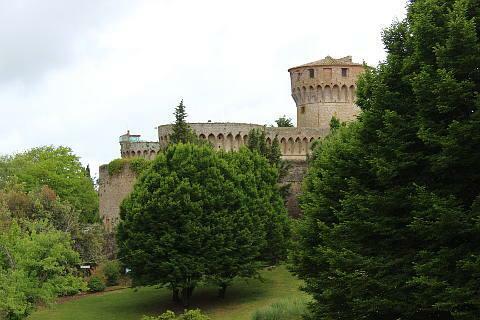 It is now an attractive Tuscan medieval hilltop town with a great deal of interest to discover and enjoy, in an impressive setting with far-reaching views across the plains of Tuscany. Italy This Way comment: the combination of the Etruscan Museum, the Roman theatre site and the historic town around the lovely medieval square called Piazza dei Priori make Volterra an interesting and varied town to visit. The town has also received the Italian Orange Flag award for sustainable tourism. There is a great deal to enjoy during your visit to Volterra, including the Ancient Roman acropolis, the medieval centre of the town itself, and some highly regarded museums. If you visit in mid August you can also enjoy the town's medieval festival. 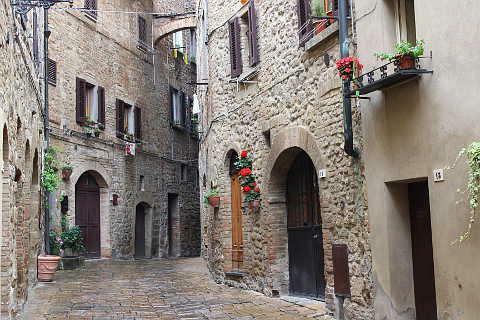 Volterra still has a typical medieval appearance which has been preserved almost intact over the centuries. The 13th century city walls are also well preserved and retain a few of the original gateways. At the centre of the town is the Piazzo dei Priori surrounded by wonderful medieval buildings built in a mellow sienna coloured stone. The Piazza dei Priori dates from the 12th century and is surrounded by palaces and classic Tower-Houses. Amongst these the the Praetorian Palace, former seat of the Captain of the People, which has a stone pig on a shelf near the top of its crenallated tower. This tower is thought to be one of the first towers built in Volterra. However the two main buildings are the wonderful Palazzo Priori and the Bishop's Palace. The Palazzo Priori, with its bell-tower and distinctive castle-like appearance dates from the beginning of the 13th century, making it the oldest Town Hall in Tuscany, and contains 14th century frescoes. Note the Della Robbia glazed coats of arms on the front of the building. The Palazzo Vescovile was originally built as a grain store but was converted to the Bishop's Palace when their original residence was demolished to build the fortress. 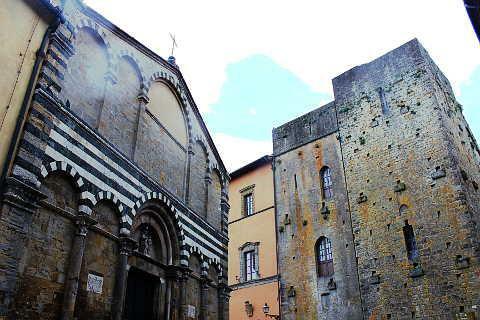 In Piazza San Giovanni you can see the magnificent 12th century Volterra Cathedral, in the local Pisan variant of romanesque style and with three naves. The cathedral was renovated in the 16th century, while the chapels of the transept in the cathedral date from the 17th century. Be sure to visit the interior of the cathedral to see the traditional black and white striped walls and arches that are common in this part of Italy. Among the works of art in the Cathedral note in particular the 13th century carved pulpit; “Deposition", in polychrome wood; the ciborium and two angels carved by Mino da Fiesole (1471); the “Annunciation” by Mariotto Albertinelli (1497) and the “Adoration of the Magi", a fresco by Benozzo Gozzoli. Next to Volterra cathedral is a 13th century Baptistry, with a rectangular plan and which shows traces of the School of Filippo Brunelleschi (1377-1446), the architect best known as the architect of the dome of Florence cathedral. To complete your visit to the cathedral visit the Diocesan Museum of Sacred Art on Via Roma which houses various works from the Cathedral and other churches in the area. The streets around the main square are lovely to explore and also contain a number of other palaces and tower houses. On Via Sarti there are a series of buildings of great artistic value such as Salaini Palace, attributed to Antonio da Sangallo the Elder (1455-1534), which houses a collection of paintings of the Sienese School from the 14th to the 17th century. It is worth visiting to explore the building with its internal courtyard as well as to see the paintings. No less important is the Viti Palace, by Bartolomeo Ammannati (1511-1592). The Viti Palace is considered to be one of the finest residential buildings in Italy and has a series of beautifully decorated rooms open to the public. To the south of the town is an Archeological park which can be visited. The archaeological excavations at the acropolis have unearthed the remains of a neighbourhood dating back to the 6th century BC and continuing right through to the Imperial age. The discovery of votive objects (now in the City Museum) also suggests the existence of two buildings of worship dating from the 3rd - 2nd century BC. On arriving at the acropolis the first site to visit is the underground cistern, dating from the 1st century AD and which supplied water to the whole of the Acropolis. The cistern consists of a rectangular chamber with a water capacity of about 1000 cubic metres. Close to the archeological park is the Fortezza Medicea a 14th century fortress which is now used as a prison! 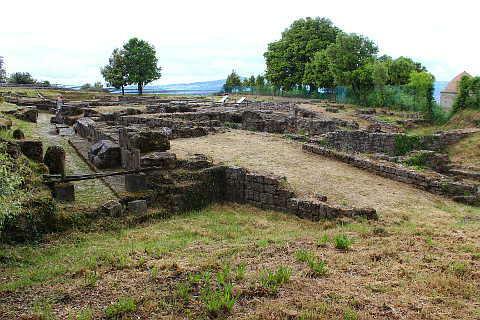 Another area of considerable interest is the Roman architectural complex called 'Vallebuona', which is to the north of the town. It consists of the theatre and thermae (baths). The ancient Roman Theatre is of a considerable size with an auditorium built against the hill, and two sets of stairs to hold about 2000 spectators. At the foot of the auditorium, there is a semicircle orchestra area 17 metres in diameter. On the Via San Felice there is a famous Etruscan gate known as the Porta dell’Arco, south of the walls and decorated with three heads that probably represent the ancient deities of the city. Elsewhere in the town Etruscan walls and another Etruscan gateway are also interesting to see. The Roman baths, the 'Terme di San Felice' are also outside the city walls. They consist of various rooms, with some of the tubs used for bathing still visible. In Desideri-Tangassi Palace you can visit the Guarnacci Etruscan Museum, among the most complete of the Italian etruscan museums. The ground floor is dedicated to archaic, oriental and classical artefacts while the second floor shows the historical period of great economic and artistic development from the 4th to the 1st century BC in Volterra. At the beginning of your visit to the museum there is a reconstruction of the tombs of the Early Iron Age (9th - 8th century BC.). These items from the excavations at the necropolis include the 'kyathos' (dipper), with a series of bronzes, and the so-called Lorenzini Head, representing a deity and the oldest cult statue in marble of central Etruria. In the other halls you can see tombs with objects of alabaster, with subjects such as the Greek myths, bronze work with mirrors, votive statuettes, potteries, and painted local ceramics with black or red figures. There is an enormous display of Etruscan funeral urns made of alabaster and terracotta. Each one with sculptures around its edges. The most memorable exhibit is the magnificent bronze statuette of an adolescent boy with a curiously elongated body, known as "Shadow of the Evening". Another very interesting museum in Volterra is the Art Gallery of the Civic Museum, at Solaini Palace, with extraordinary works by many Italian artists of the 15th and 16th centuries such as Taddeo di Bartolo, Jacopo di Michele (AKA Gera), the great altarpiece with 'Christ in glory' by Ghirlandaio commissioned by Lorenzo de Medici, and many others. You can conclude the visit to the Museums of Volterra with the Museum of Alabaster which exhibits finds tracing the history of alabaster from the Etruscans to the present. 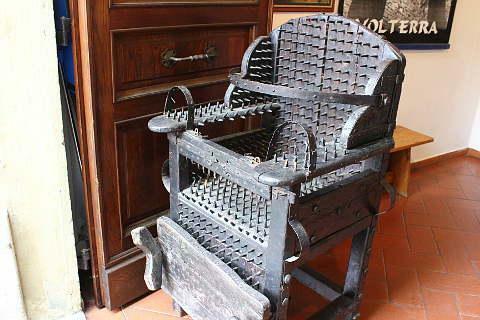 Looking for something a little more ghoulish - visit the stomach-turning museum of torture! 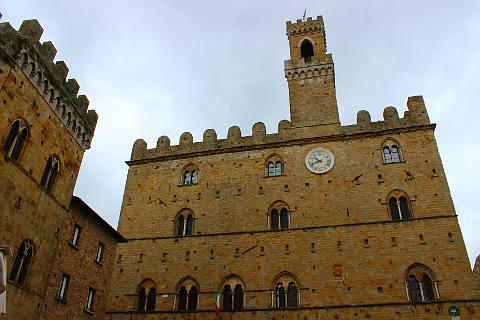 Fans of the Twilight books will remember that the powerful Volturri vampires live in Volterra in Tuscany. 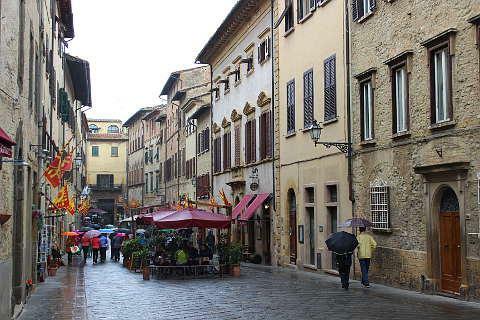 Stephanie Meyer originally planned for them to live in a fictional city but when she discovered pictures of the atmospheric main square of Volterra with a clock tower just like the one she describes in her book she decided to base them in the real town of Volterra. For the New Moon film however the scenes of the Saint Marcus day celebrations are actually filmed in nearby Montepulciano with Edward stood in front of the Palazzo Communale on the Piazza Grande. 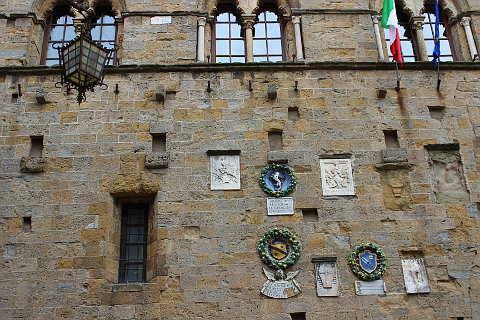 If you want to experience the Volterra of Edward and Bella you can join the New Moon tour of Volterra each evening at 5 or 6pm. Book before 1pm at the tourist office. Volterra also features in books by Stendhal, Dudley Pope, Jhumpa Lahiri, Linda Proud and Valerio Massimo Manfredi. For those who love to come into contact with nature the region around Volterra offers various hiking trails through the woods and countryside. Close to Volterra you will also enjoy wine tasting, and enjoying some typical products of the area such as sheep’s milk cheese and ricotta. 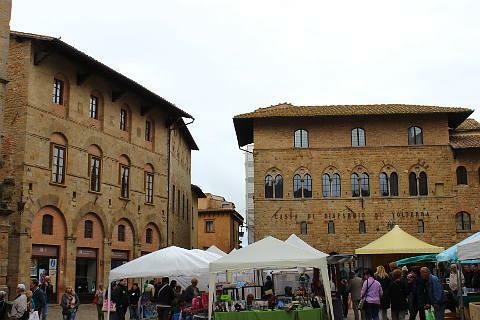 And for those who wish, there's also the chance to enjoy the famous truffles of Volterra. The famous medieval village of San Gimignano, one of the most visited villages in Italy, is just a few kilometres north-east of Volterra. See the San Gimignano guide for details. We drove from Colle di Val d'Elsa to Volterra and passed some of the best countryside we have seen on our Tuscany trip.